Factors Affecting Climate Change Can They Be Controlled? There are many factors affecting climate change and the effects are seen in a number of changes in the geography and life on earth. These changes are often in the form of disasters on a record scale. This is likely what the gospel of Matthew calls "the beginning of sorrows." (Matthew 24:8) If that is so, we will be facing more of the same. It will be interesting to see what 2016 holds. Note that I am simply sharing items of interest. That does not imply that I agree with everything presented or with other material that may be on a source's other web pages. What do you get when you add together one of the strongest El Ninos ever recorded, the worst year for wildfires in U.S. history, and unprecedented earthquake swarms in diverse places all over the country? Since the end of the summer, America has been hit with a truly unusual series of natural disasters. The state of Oklahoma has already set an all-time record for the number of earthquakes that it has experienced in a year, more acres have been burned by wildfires in the U.S. than we have ever seen before, and a "1,000 year rainfall" caused horrific flooding in South Carolina. Those are just a few examples of what we have been seeing, and many believe that this is just the beginning. So why is this happening? Is there something that connects all of these natural disasters together? Let's start by talking about earthquakes. In the past, we would expect to see earthquake activity along the west coast, but not much elsewhere. As 2015 nears its end, 850 earthquakes of magnitude three or greater have stirred the state of Oklahoma. Compared to 584 of the same magnitude in 2014 and 109 in 2013, the trend is clear: earthquakes are on the rise. More than 40 small earthquakes were recorded in east-central Idaho last week in what experts say is another earthquake swarm in the region. Officials in the Challis area on Friday reported no damage from the micro-quakes that started Tuesday and have mostly gone unnoticed or unreported in an area with residents accustomed to more vigorous shaking. But the temblors ranging up to 2.9 magnitude have perked up scientists trying to understand the fault system in the area where a 5.0 magnitude quake struck in January. So why are we seeing so many earthquakes all of a sudden? That is a question that none of the "experts" seem to have an answer for. NEW YORK -- The warming Arctic has set another record. The average air temperature over Arctic land reached 2.3 degrees F (1.3 degrees C) above average for the year ending in September. That's the highest since observations began in 1900. The new mark was noted in the annual Arctic Report Card, released Tuesday by the National Oceanic and Atmospheric Administration. 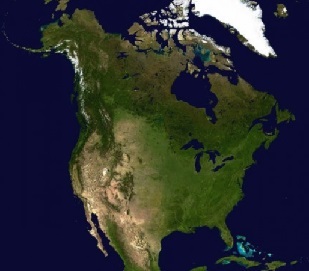 The Arctic centers on the North Pole and reaches into North America and Eurasia. 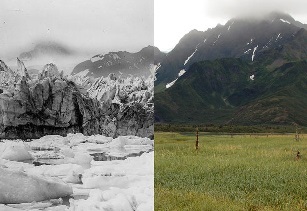 "Warming is happening more than twice as fast in the Arctic than anywhere else in the world. We know this is due to climate change," NOAA chief scientist Rick Spinrad told reporters in San Francisco at a meeting of the American Geophysical Union. Another record emerged for sea ice, which appears when Arctic Ocean water freezes. When it reached its peak coverage in February, it was the lowest maximum extent since records began in 1979. The minimum ice coverage, reached in September, was the fourth lowest on record. "We are increasing greenhouse gases, the planet is heating up, the ice is melting, and this means we should expect new records to be set," Jennifer Kay, an atmospheric scientist at the Cooperative Institute for Research and Environmental Science at the University of Colorado, told CBS News last spring. "The record-low Arctic sea ice extent this winter is not surprising to me from a scientific standpoint." 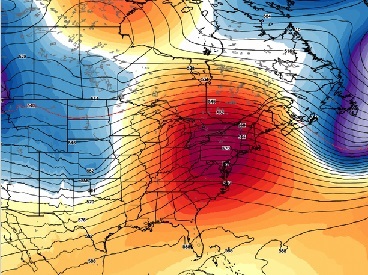 After this chilly weekend, the Eastern U.S. will turn warm again. The warmest days are still a week away, and in any other situation it would be too soon to start talking records. But at least so far, forecast models have been in remarkable agreement that Christmas 2015 will be one for the record books up and down the East Coast. Warm high pressure will steadily build over the Eastern U.S. starting Monday. By Dec. 24, temperatures in the Mid-Atlantic and Northeast could be running 30 degrees above average for this time of year. A bit farther north in Montreal, temps could exceed 40 degrees above average. In Washington, D.C., the forecast models have been in pretty good agreement that temperatures will at least exceed 65 degrees in the days leading up to Christmas. The European model has been forecasting a high in the low to mid-70s for all three D.C. area airports on Christmas Eve. Fluid injection from hydraulic fracturing, or fracking, triggered a 4.6-magnitude earthquake that struck northeast British Columbia (BC) over the summer, the Canadian province's energy regulator has confirmed. It's the largest fracking-caused earthquake in the province to date, according to The Canadian Press. Or, more significantly, it could very likely be the largest fracking-caused earthquake in the world. "This seismic event was caused by hydraulic fracturing," Ken Paulson, CEO of the BC Oil and Gas Commission, said in a statement. Fracking, which has helped drive U.S.' gas prices below $2 a gallon, involves shooting large quantities of water and chemicals at high pressure to release gas and oil from layers of subterranean shale. The earthquake struck this past August about 110 kilometers northwest of Fort St. John in BC. Its epicenter was three kilometers from a fracking site operated by Progress Energy, prompting the natural gas production company to temporarily halt operations after the quake hit. The company said in a statement that it's taking the incident very seriously and it has 17 monitoring stations in its operating area to accurately detect seismic activity. Progress Energy also has the dubious honor of holding the previous record for the largest known fracking-caused quake in BC with a 4.4-magnitude tremor in 2014. 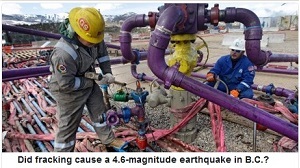 As CBC News noted, the 4.6 August quake may likely be the largest in the world caused by fracking. Ray's note: I live in British Columbia (although in the southern part of the province and nowhere near this activity) so this was of interest to me. Pope Francis said the U.N.'s conference on climate change that began in Paris on Monday may be one of the last opportunities for countries to take steps toward avoiding an environmental catastrophe. "I am not sure, but I can say to you 'now or never,'" he said when asked if he thought the Paris summit would be a turning point aboard the papal plane on Monday, Reuters reports. "Every year the problems are getting worse. We are at the limits. If I may use a strong word I would say that we are at the limits of suicide." Pope Francis, who pushed for Catholics to pay attention to climate change last year, pointed to rising sea levels and Greenland's melting glaciers as evidence of a need for nations to act during a conference with reporters on a flight back to Rome after his six-day visit to Africa. "I am sure that the [Paris delegates] have goodwill to do something. 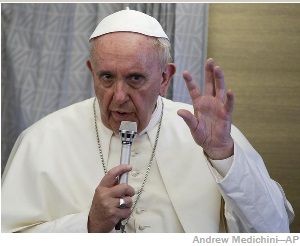 I hope it turns out this way and I am praying that it will," Francis said. Ray's note: whether the factors affecting climate change are caused by human activity or not they are being used to promote an agenda; to push us toward a one-world order. Random Islamic terror attacks are now going to be part of every day life in America. Once upon a time, those of us that warned that Islamic terrorists were already in this country were branded "alarmists", but not anymore. 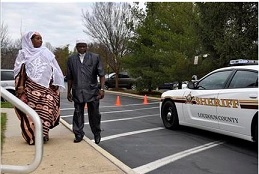 When Muhammad Youssef Abdulazeez gunned down four U.S. Marines at a Navy and Marine reserve center in Chattanooga, Tennessee earlier this year, that was just a very small preview of what is coming. On Wednesday, a married couple named Syed Farook and Tashfeen Malik fired at least 65 shots at a holiday office party in San Bernardino, California. 14 people were killed and 21 were wounded. Later on, hundreds of shots were exchanged as police officers pursued the vehicle that Farook and Malik were attempting to escape in. Fortunately, Farook and Malik are no longer a threat to any of us, but there are thousands more radicals just like them that are already living in this country and that are ready to act at any time. On Thursday, many in the mainstream media were attempting to figure out what could have possibly motivated a married couple with a new baby to go on such a shooting spree, but it doesn't take a genius to figure it out. BIRMINGHAM, Ala. (AP) -- In Alabama, a Presbyterian church wanted to be able to hire its own police for protection. Mosque leaders around the country are meeting with law enforcement officials as an anti-Muslim furor fuels arson attacks and vandalism. And the Federal Emergency Management Agency has been holding specialized training for congregations for "all hazards, including active shooter incidents." Christian churches have been refining their security plans ahead of receiving some of their largest crowds of the year for Christmas. On a FEMA webinar last Wednesday on protecting houses of worship, the chief security executive at The Potter's House, the Rev. T.D. Jakes' megachurch in Dallas, gave tips about behavior that should raise concern, such as a congregant arriving in a long coat in hot weather. If needed, church greeters could give a hug and feel for weapons, said the executive, Sean Smith. "I call it the Holy Ghost pat-down," Smith said. Hamas is attempting to launch major terror attacks against Israel, including suicide bombings, from the West Bank, a senior Palestinian Authority source told The Times of Israel. Information gleaned from interrogations of Hamas operatives arrested recently by PA security services shows that the terror group's leaders in Gaza and abroad have sent orders to local commanders to escalate their activities — from encouraging protests and stabbing attacks to more dramatic and deadly assaults on Israeli civilians, the source said. Some two dozen Israelis and others have been killed in a wave of Palestinian stabbings, car-rammings and shootings since the start of October. More than 100 Palestinians have been killed, a majority of them attackers who died during their terrorist attacks. Over 1,000 Israelis were killed in terror attacks, including dozens of suicide bomb attacks, during the Second Intifada, from 2000 until roughly 2004, many of them carried out by Hamas operatives. The PA sources said Hamas's new efforts to escalate the violence would further raise tensions, as Israel would be expected to counter the increased violence with further clampdowns on Palestinian areas in the West Bank, in turn leading to a weakening of the Palestinian Authority – a key interest of Hamas. Israeli officials are also expressing concern about the possibility that suicide bombings will be renewed, shifting the nature of the current terror wave from a largely uncoordinated series of low-level attacks to a much broader campaign. Dozens of Hamas operatives and commanders have been arrested by both PA and Israeli forces in recent weeks in the West Bank. 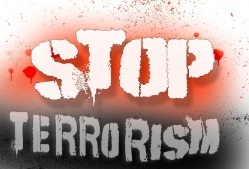 Hamas has repeatedly called for lone-wolf attacks in recent months. Last week, Hamas leader Khaled Mashaal praised the attacks on Israelis, saying Palestinians have come to the conclusion that the peace process is futile, and therefore the path of "jihad, sacrifice, and blood" is the only way forward. Militant Islamist fighters wave flags as they take part in a military parade along the streets of Syria's northern Raqqa province June 30, 2014. The fighters held the parade to celebrate their declaration of an Islamic "caliphate" after the group captured territory in neighboring Iraq, a monitoring service said. 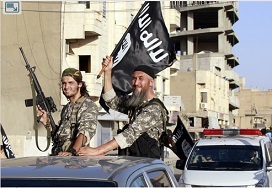 The Islamic State, an al Qaeda offshoot previously known as Islamic State in Iraq and the Levant, posted pictures online on Sunday of people waving black flags from cars and holding guns in the air, the SITE monitoring service said. The Islamic State terror group has recently claimed that the "world will end" after it allegedly kills Pope Francis. The terrorist group recently released a chilling video via its social media wing that shows Islamic State militants descending on Rome. The scenery of the video appears to imply that Rome is the site of the apocalypse, and the Islamic State militants suggest in the video that they must successfully defeat the pope and the Christian religion to claim victory for their fundamentalist beliefs. This is not the first time the terrorist group has made reference to Rome, Italy as being the final battle ground for the end of the world. William McCants, an expert on jihad, previously told the Daily Express that extremist Muslims believe they will have successfully taken over the world when they defeat the pope in Rome. (NaturalNews) As Europe continues to entertain, feed, clothe and shelter hundreds of thousands of migrants and refugees from the war-torn Middle East, countries are being repaid with threats of violence and death from the region's most-feared Muslim terrorist group, the Islamic State of Iraq and Syria. As reported by Britain's Express (in online editions), ISIS jihadis have sent letters to citizens of historically neutral Sweden and across Europe, ordering them to either convert to Islam within days, or face beheading in their own homes. Persons whom authorities believe to be affiliated with ISIS, posted notes on doors of dozens of random homes in several cities across Sweden, including the capital of Stockholm, threatening to kill "non-believers" in a campaign of violence that has many terrified. As such, Sweden is now essentially on lock-down, after letters pledged beheadings and then to "bomb your rotten corpses afterwards." Officials confirmed that intelligence agencies are investigating the threats, each of which have been signed by ISIS, as fear gripped Swedes and others throughout Europe. The researchers injected Anopheles stephensi mosquitoes with a new DNA code that makes them resistant to the parasite that causes malaria. Further, a controversial "gene drive" technique was used that allows the "frankenbugs" to pass their resistant genes onto their offspring. In a recent study, 99.5 percent of the GE mosquitoes' offspring carried the malaria-blocking genes.1 If the mutant mosquitoes are released into the wild, thereby mating with wild populations, their GE DNA would pass freely onto their offspring. "What's scarier? Tinkering with mosquito DNA, or malaria? … Without proper caution, some scientists warn, gene drives could deliver ecological disaster. Without the right consideration, we could unleash monsters." "Gene drive" technology, which has been around for about a decade, allows scientists to not only insert specific gene mutations into DNA but also to ensure those modified genes get passed onto offspring. "Malaria is only the beginning. Geneticists have suggested other types of gene drives that could be implemented to solve the world's problems. But the daydreaming is stunted by fears of unintended consequences and a disdain for 'unnatural' human intervention. What happens if newly introduced genes end up having unexpected long-term effects on a species? Or on other species that it might cross-breed with? What are the chances of an unexpected mutation? ... Fears of the unnatural will certainly persist, but gene drive will change the conversation completely. That's because there's no 'opt-out' feature in gene drive technology. People may have objections to genetically modified foods, but they don't have to eat it." (NaturalNews) When activist filmmaker Ami Horowitz visited the Yale campus to see how many students would sign a demand to eliminate the entire First Amendment, he was shocked to find that they gladly supported the idea! In this YouTube video, you'll see Horowitz asking Yale students to sign his petition because "hurtful" speech shouldn't be "protected" by the Constitution. And they not only sign the petition, they verbally endorse the idea with great enthusiasm! This activism approach -- made most famous by Mark Dice with his relentless series of hilarious videos extolling the absolute idiocy of American voters -- reveals that even America's finest educational institutions have become little more than anti-American indoctrination centers churning out complete idiots as graduates. That Yale students actively seek to eliminate all these protections by revoking the entire First Amendment is nothing less than astonishing.